I’m reading the Guide to Glorantha at the moment, and this bit of art brought joy to my heart. 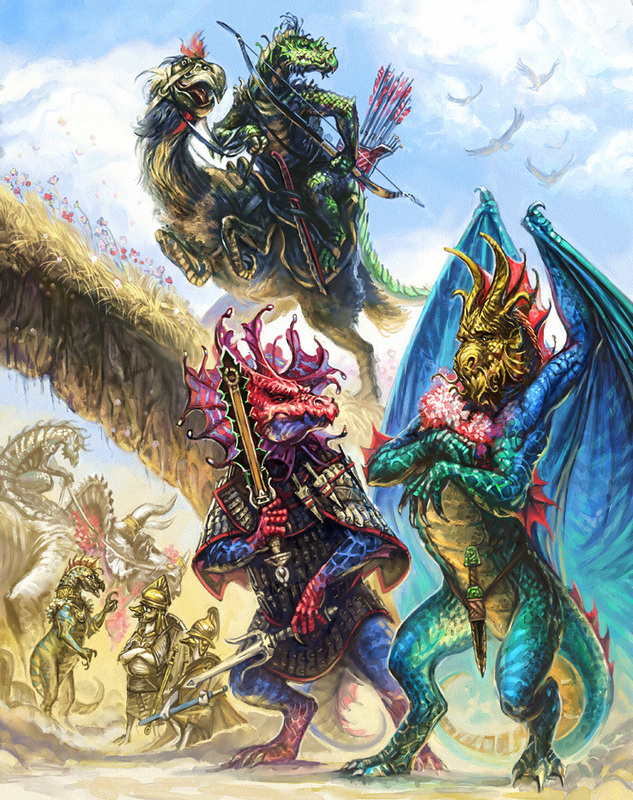 Not just the awesome depiction of dragonewts – though they are cool – but how in the background you can see a dragonewt negotiating with a party of ducks. Now, these are unabashedly ducky ducks. We’re not dealing with the sort of situation you see sometimes in D&D, where someone takes a creature whose description was originally a bit goofy and tries to make it look a bit more badass and realistic (like how Demogorgon’s heads don’t really look like chimp heads any more). No, these are not watered down at all. And that’s great. For those who don’t know, ducks are in RuneQuest effectively as a little homage to the awesome Carl Barks Scrooge McDuck comics; folk of my generation may be less familiar with them, but will be familiar with Duck Tales, which was basically Carl Barks’ Duck Comics: the Animated Series. Ducks aren’t a sloppy, crowbarred-in addition, mind: they have a very specific history and cultural place in the world which incidentally makes them total badasses. Unseen Phil’s tumblr post compares the duck thing to the way people react to the “men culturally ride side-saddle if they ride at all so all cavalry warriors are women” thing in the default setting of Reign, but I think there’s a mild difference there. Both Glorantha and Reign‘s setting are a bit weird – with Reign I personally found the side-saddle thing not especially odd, since it’s basically a cultural assumption, but found the shonky geography to be kind of annoying – but I think there is a crucial difference. Reign‘s weird bits have a whiff of “try-hard” about them, like Stolze is straining to throw in odd little things simply for the sake of being odd. Conversely, Glorantha’s oddness is richly contextualised, and so far as I can tell has been from the start. It probably helps that Greg Stafford was thinking about and developing the setting for about a decade before producing any games or other publications set in it, whereas Reign‘s setting comes across as something Greg Stolze made up on the fly when cooking up the game because he thought a more generic version of the system wouldn’t get traction. Either way, for whatever reason I find that I can buy into the eccentricities of Glorantha far more easily than those of the default Reign setting. Anyone whose imagination can embrace wizards, vampires, werewolves, owlbears, monsters that have literally evolved to look like treasure chests for the sake of trolling adventurers, and a host of “animal heads on human bodies” creatures of all varieties but balk at angry death-worshipping waddling heroes defending the cosmos against undead horrors is welcome to take it up with Donald here. 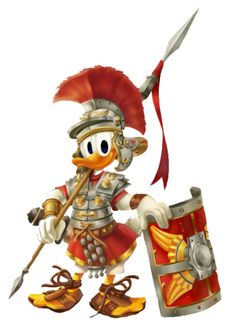 Donald had this armour designed specifically to mock the Lunar Empire, because he’s a badass like that. Great, thanks for catching that.